News	Forums Dreamcast Game Scheduling Phantasy Star Online Help? Okay thanks, I also need the access code just to create a new game, can you send me a link to sylverant’s site? death_pixel wrote: It’s not behind the disc in the jewel case, is there a way to use an access code from a different pso? Like an access that didn’t come with mine? You can use a shared serial and key (just Google search it) but it will prevent you from participating in Sylverant events and using some of the server features like character backups. I recommend buying a complete copy with a unique serial and key. Just be sure the serial and key are included before you buy it (ask the seller if need be). 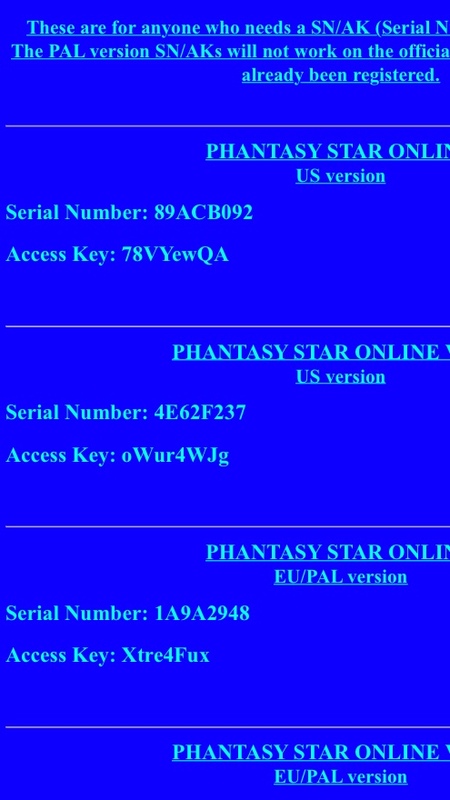 I did find a list of serial numbers and access keys for different regions, I used the US version. Can you give me the serial number and access key for sylverant’s server? All you should need is the one serial and key. To get online you still need a patch disc to connect to the new servers. Or a cdi of the game with patch built in.